Head Coach Phillip Davis aims to bring home the men’s National NCAA Championship next year. Phillip Davis is on a roll since becoming swimming and diving head coach four years ago, and he has no plans to slow down. He joined UIW in 2006 as the women’s coach and began building what was only a three-member team at the time. That worked so well that in 2007, he established a men’s team, which ranked 17th in Division II. Since that time, UIW has seen three individual national swimming champions, the only three of any sport in the university’s history. Last year they ranked No. 11, and in March, the men’s team moved to the No. 2 position at the National NCAA Championship meet. All Davis’ hard work paid off. 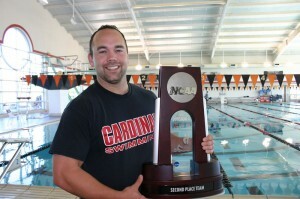 At 32, Davis was voted the NCAA Division II Coach of the Year by the College Swimming Coaches Association of America. 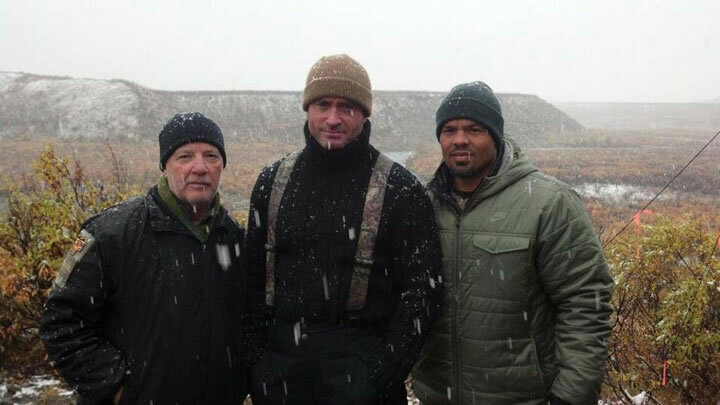 He admits he’s always been a good recruiter and motivator. At his previous job as assistant coach at Ouachita Baptist University, his duties included recruiting, and even as a student-athlete himself, he worked to sign up new swimmers. So he knew he could recruit new talent. The question he always faced was whether he could actually coach. Now that question has been answered. During the offseason, from mid-March until September when the season begins again, the athletes practice eight hours a week, and summer practices are entirely voluntary. Coaches focus harder than ever on their grades, but academics are not a problem for these teams. The women have a cumulative GPA of 3.3 and the men 3.1. In the fall semester, there were 12 swimmers with a 4.0. 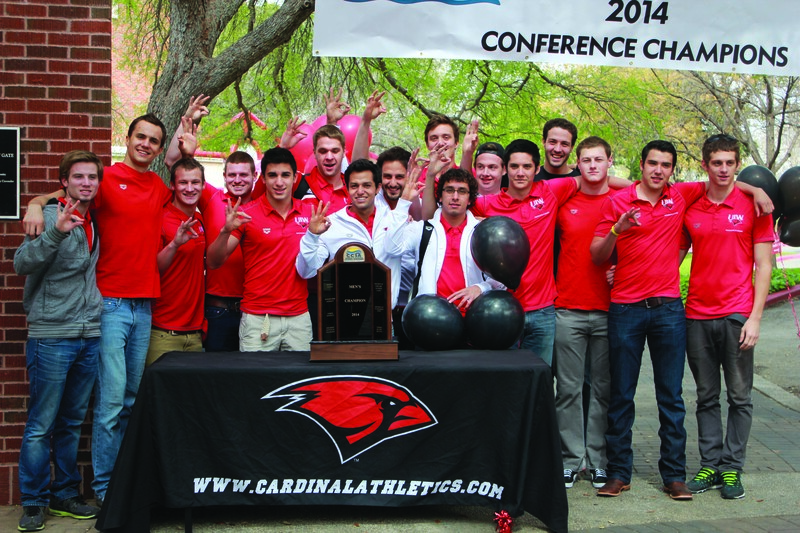 UIW’s swim teams are at the point now, Davis said, that the coaches have to be more selective about who makes the team. There were more than 200 swimmers hoping to make the teams of about 30 swimmers each, and Davis wants to be sure he can devote enough attention to each of his student-athletes. “We want it to be special to be part of the team,” Davis said. His recruiting efforts are extending internationally, and he expects eight to 10 international students on the teams next year. Davis said UIW competes against SEC Division I schools for athletes, and many times it simply comes down to the priorities of the students. “All of our kids that received any scholarship money here had offers to go swim at Division I schools. They just chose to come here,” Davis said, naming close relationships with coaches and professors as a draw for those students. Davis also credits those close relationships with others in the UIW community. 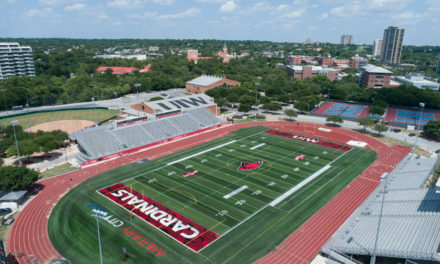 UIW will play host to the NCAA National Championships at Palo Alto College next year from March 9-12. Mark your calendar to join the fun! You can also join the fundraising group called the Lane Changers to receive e-mail updates on events and the teams’ achievements. To get involved, e-mail Coach Davis at padavis@uiwtx.edu.